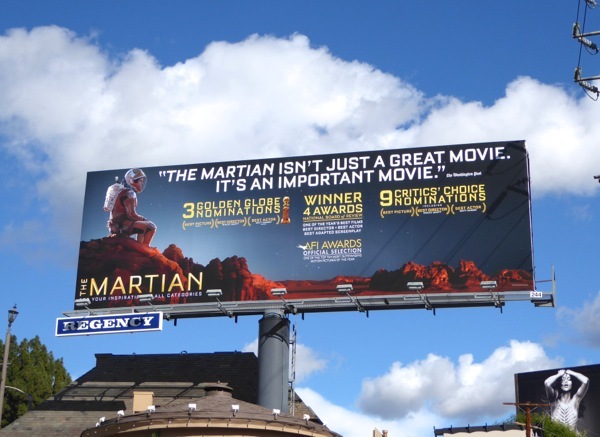 One of the perks of being trapped millions of miles away on Mars is that you're probably not going to get into any trouble on social media or for any remarks you make promoting your movie #damonsplaining. 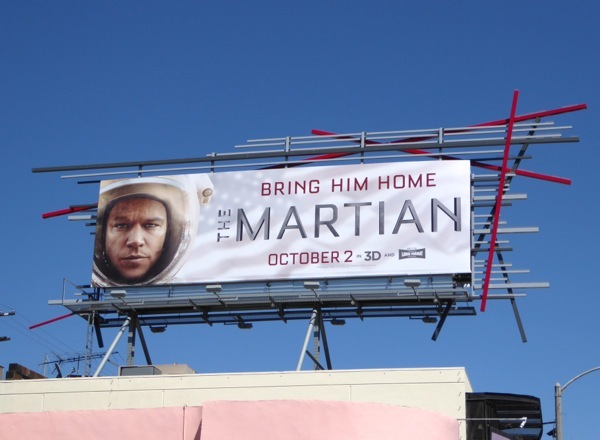 Regardless of his views on racial equality or gay actors remaining in the closet, Matt Damon is earning rave reviews for his latest role as an astronaut stranded on the Red Planet when a storm hits his manned exploration team and he's left for dead on Mars. 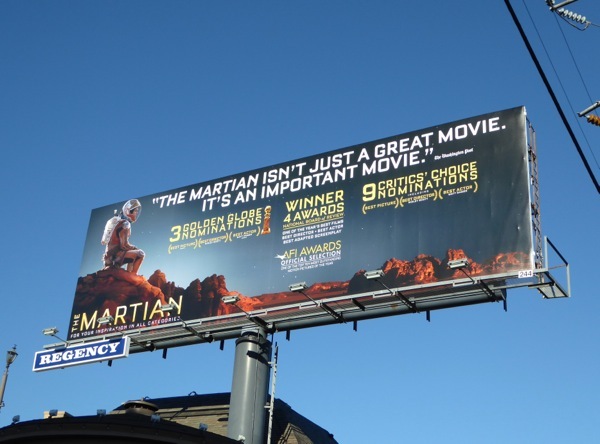 Surviving, but stranded and alone, he must use all his ingenuity and skills to survive and find a way to contact the Earth in this adaptation of Andy Weir's 2011 bestselling novel of the same name. 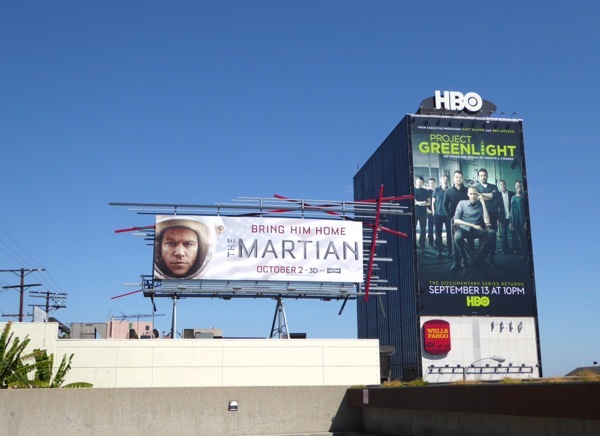 These movie billboards for The Martian were first spotted along Sunset Boulevard in West Hollywood on September 6 (interestingly across the street for the giant billboard for the fourth season of Project Greenlight which he exec produces) and further east along the Strip on September 13, whilst the construction hoarding posters were spied along Santa Monica Boulevard in West L.A. on August 30, 2015. 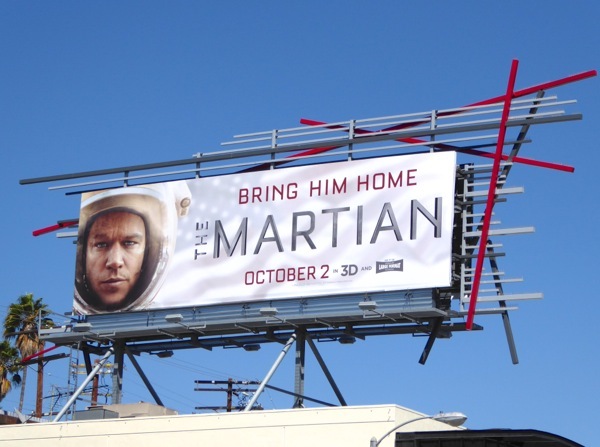 To go further behind-the-scenes, be sure to also check out Matt Damon's NASA spacesuit from The Martian on display at ArcLight Hollywood cinema. 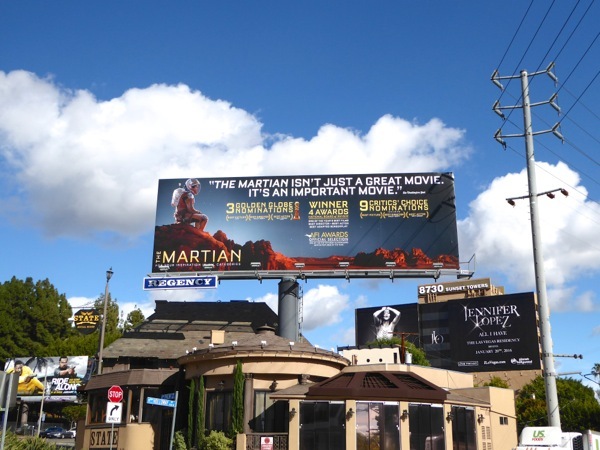 With all the latest Mars Exploration Rover Mission images from NASA and the discovery of liquid water on the fourth planet from the Sun, interest has never been greater in the Red Planet, so it looks like the future is rosy for The Martian. 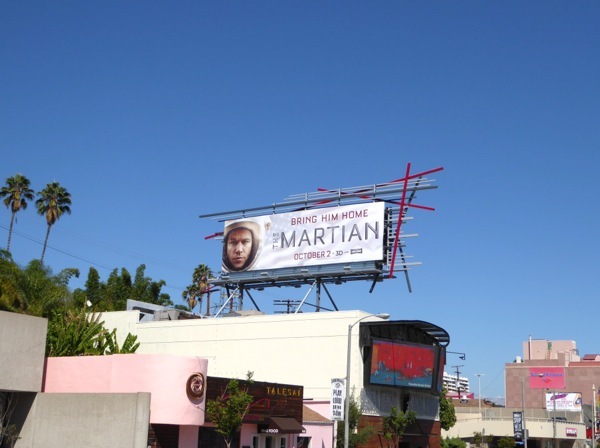 UPDATED: Here's a bold billboard for the The Martian snapped along the Sunset Strip on January 7, 2016, during awards season with its many of its movie industry nominations highlighted. 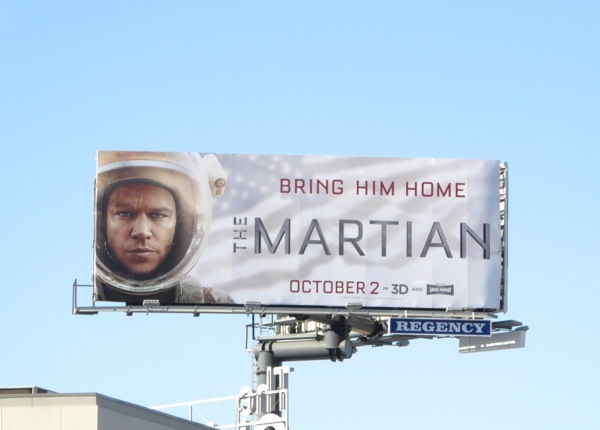 Let's see what awards it can 'bring home' this year and what the film's Oscar chances are. 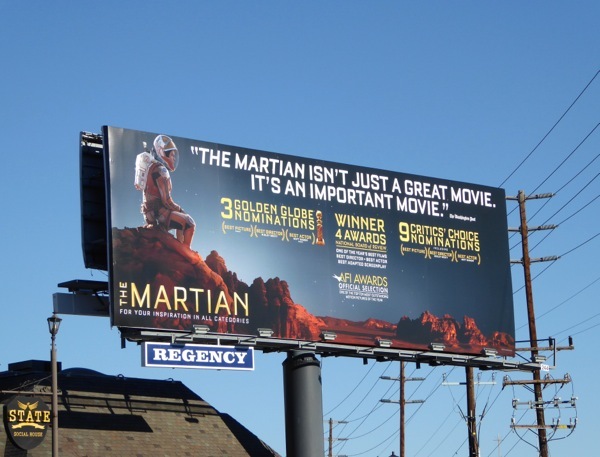 UPDATED: Well that awards billboard seemed to do the trick as The Martian won Best Actor for Matt Damon and Best Motion Picture, rather bizarrely both in the Comedy or Musical category though, at the on Sunday January 10, 2016. 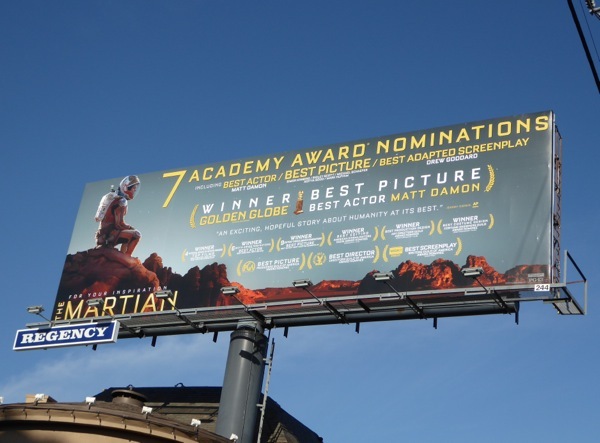 To celebrate here's the billboard on a clearer day with less shadow cast by the overhead power lines. Now let's see how the movie fares at the Oscars. 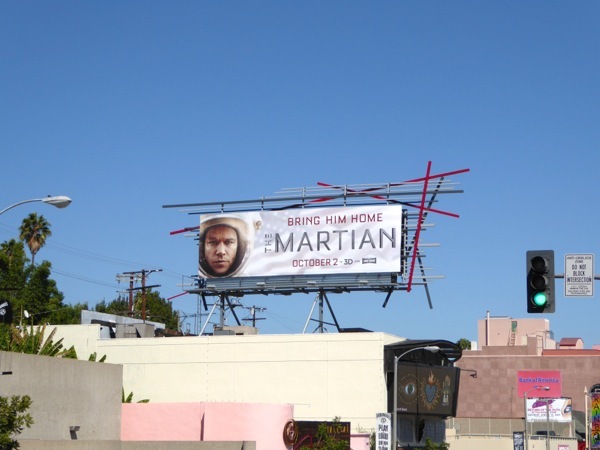 UPDATED: After picking up two Golden Globes, The Martian has now set its sights on the Oscars with this new billboard snapped in the same location on January 24, 2016. 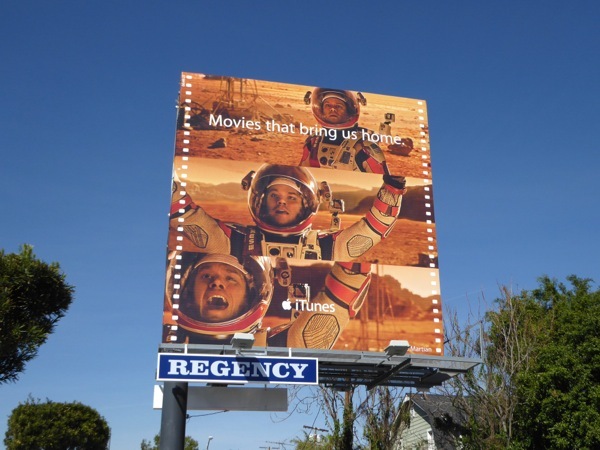 UPDATED: The Martian has not only enjoyed phenomenal success at the box office on the big screen, but also in digital sales, so it's no wonder the film is included in Apple's iTunes movies outdoor ad campaign. 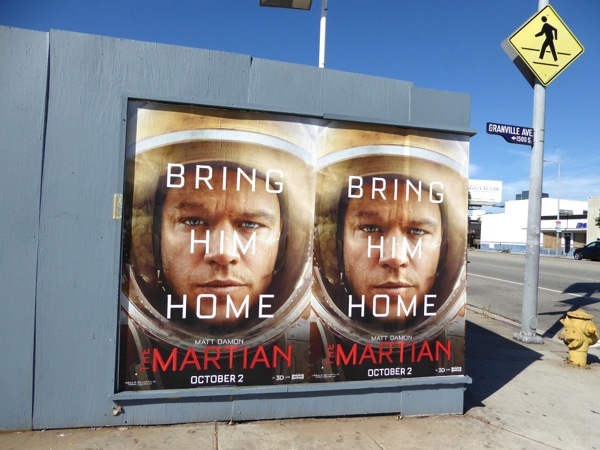 This cool ad creative featuring Matt Damon's castaway on Mars was snapped along Fairfax Avenue on February 24, 2016. Could I use one of these photos for my school yearbook?